Ashley and Jaquavis books do not always have a happy ending. In fact, I don’t think I’ve read a book of theirs yet that has one. However, what these two deliver are consequences of actions, the good, the bad, and darn right ugly. The good girls or guys do not always win. While that is unfortunate, it’s real. 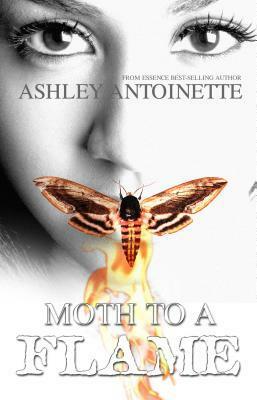 In Moth to a Flame, Ashley Antoinette rides solo and delivers a story about a teen girl in love with the wrong man. Moth to a Flame reminds me of The Coldest Winter Ever. Like Winter, Raven grows up the child of a drug boss. She thinks she is grown at the age of 17. Raven meets a stick-up kid named Mizan (like Bullet), who is looking for his rise to power. Once he discovers Raven is the daughter of Benjamin Atkins, the reigning drug boss, he does what is necessary to obtain her heart and loyalty, including abusing her. Benny knows the game and warns Raven to end the relationship. Despite her father’s protests, she decides to remain loyal to Mizan and forsake her family. Of course, she eventually learns the truth about him. It doesn’t end well for her. Like Midnight in TCWE, there is Ethic. He is a loyal, trusted partner of Raven’s father. Although Raven had been feelin’ him the moment she laid eyes on him, Ethic repeatedly shoots down her advances. Ethic knows she is immature and is not the type of woman he needs in his life. Nevertheless, the two are reunited when circumstances place them together. In brief, the story is quite a sad one. We read through the abuse and naiveté and watch Raven grow into a woman and finally have love. I wanted a happy ending, but there ain’t one. (Why Raven can’t be great? *sobs*) Mizan finally gets his in the end, though. If you liked The Coldest Winter Ever, you will like Moth to a Flame.